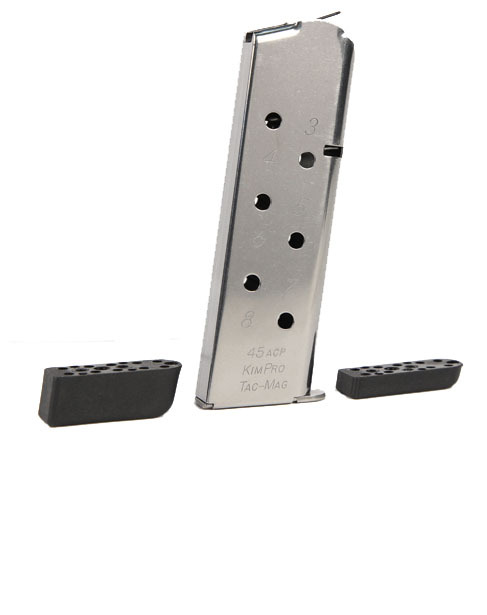 Manufactured from high grade stainless steel, these Kimber KimPro Tac-Mag 8 round .45ACP 1911 magazines will fit your full size 5 inch Government Model and 4.25 inch Commander Model 1911 platform pistols. The Kimber KimPro Tac-Mag feature a removable base with three choices for base thickness. You can use the flat matel base plate or choose one of the polymer bumper pads. Magazines look great and work great on my Kimber eclipse, very smooth and no malfunctions. Good, inexpensive 1911 Mags. I haven't had the opportunity to fire the gun with them yet, but I have faith in Kimber's ability to make a decent 1911 magazine. I will update once I test them out. Magazines arrived OUT of their original blister pack. They were loose in a baggie with the corner that contained the UPC code cut from the original package. I have purchased many of these magazines (mostly in person at the top gun store). I’m sure the magazines will be good as always, but the way they were repackaged was a huge disappointment. These were purchased as a gift for my father-in-law. Very weak on “Top” Gun’s part. I’ll pay more elsewhere next time. Fair prices. Fast shipping. Responsive customer service. My go to place for mags and parts. I have several of these, and feeding has been flawless through 3 different makes of 1911s. Plus, you're really lucky if you can find these at a lower price elsewhere. Top Gun's service and prices are the best!